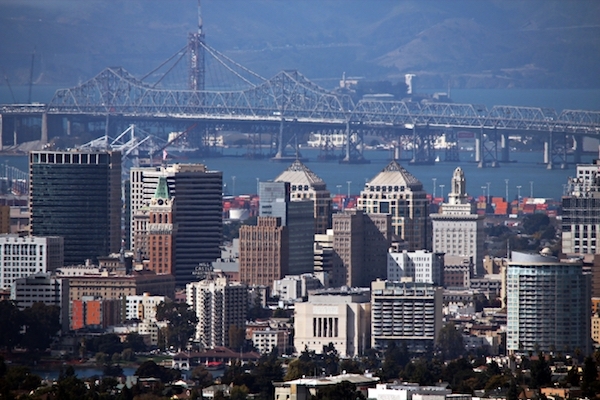 Over $6 million: That’s how much money flowed into the war chests of Oakland candidates and Political Action Committee (PACs), or independent spending groups, in the November election for mayor and city council seats. But how much money a candidate raised wasn’t the most reliable way to predict who won. For example, Nikki Bas won in District 2, but spent less money than the incumbent, Councilmember Abel Guillén. However, in District 6, the candidate who spent the most money won: Businessperson and nonprofit executive Loren Taylor unseated incumbent Councilmember Desley Brooks. Rather, the key was how much money PACs spent towards a candidate’s election. In all of the council races, either the candidate with the most PAC spending won or the candidate with the most opposition PAC money lost. 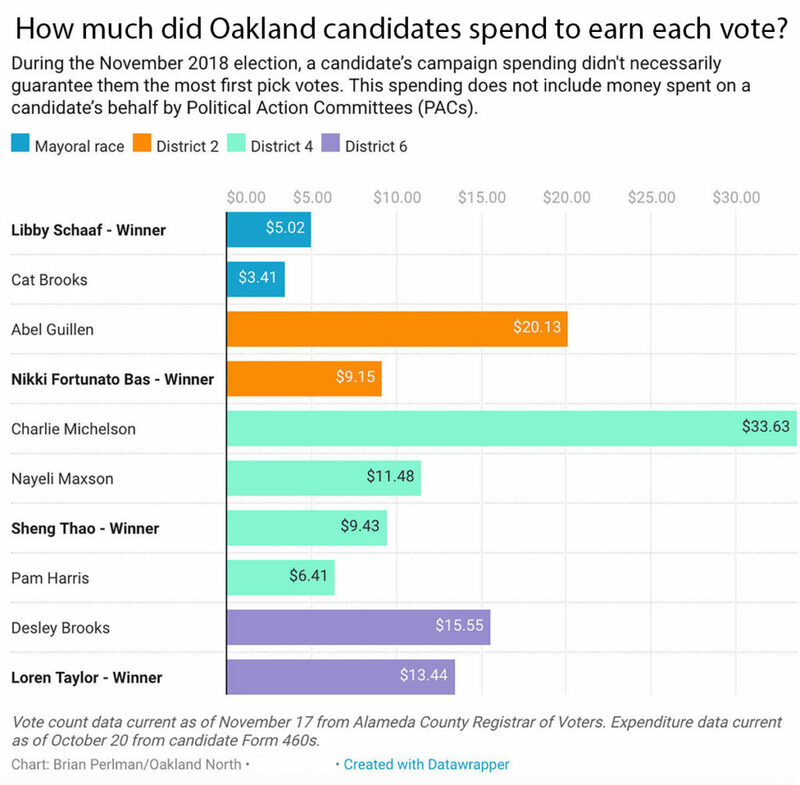 Oakland North calculated how much each candidate spent per vote by looking at mandated campaign financial statements, or Form 460s, for each candidate from January 1, 2017, to October 20, 2018, the latest filing date. The number of votes is taken from the Alameda County Registrar of Voters tally as of November 17, the final vote count. We used only first pick votes. Winner Mayor Libby Schaaf spent the most money in the mayor’s race—roughly three times as much as the second-place candidate, community-organizer Cat Brooks. Schaaf spent $1.61 more per first-place vote than Brooks spent, for a total of $5.02 per vote, while Brooks’ campaign spent $3.41 per vote. Compared to all the others, this race saw the least PAC spending. Outfront Media, an advertising business, spent $7,500 on billboards on Schaaf’s behalf. 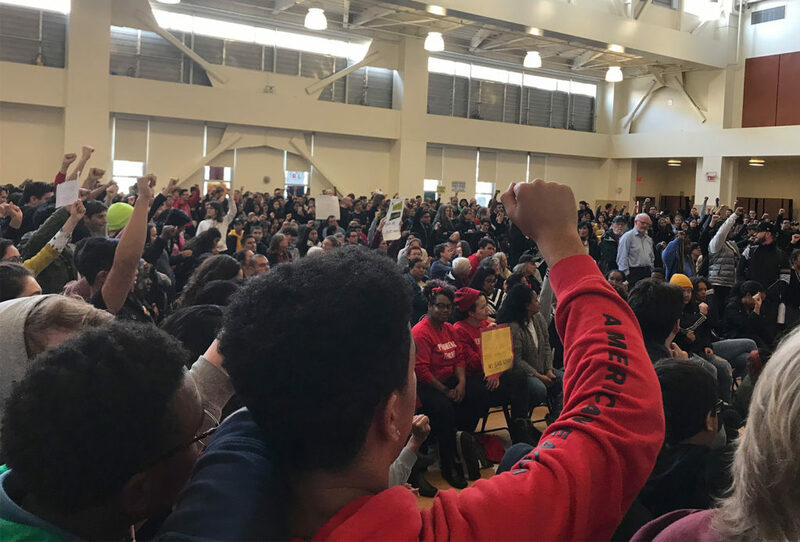 The Oakland Rising Committee sponsored by Movement Strategy Center Action Fund, two grassroots political organizing nonprofits, spent $2,363 on Brooks’ behalf. In District 2, Bas pulled off the most stunning upset of the election, unseating incumbent Guillén. Her campaign also spent less than Guillén’s; $103,161 compared to Guillén’s $166,859. This gave Bas’ campaign a total of $9.15 spent per vote, while Guillén’s spent $20.13. But when adding in PAC spending, Bas had more money spent towards her election than Guillén did. East Bay Working Families, a union and community organizing group, spent $113,018 in support of Bas. For Guillén, International Association of Firefighter Local 55 Political Action, a firefighter’s union, spent $47,523 on his behalf, while East Bay Working Families spent $4,807 against his election. The biggest spender in the District 4 race, former shipping company owner Charlie Michelson, dropped out of the race in mid October. The next biggest spender after him was former Fulbright fellow Pam Harris who spent $64,036, which totaled out to $6.41 per first choice vote received. The winner of District 4, Sheng Thao, only spent $55,971, which came out to $9.43 per vote. However, much like in District 2, winner Thao had the most PAC money spent on her behalf. For example, Unity PAC, which was funded by union dues and donations from the Alameda Labor Council, spent $105,974 towards electing Thao. This was the most PAC money received by any candidate in the District 4 race. In District 6, Loren Taylor outspent and beat incumbent Desley Brooks. Taylor’s campaign spent $95,964 compared to Councilmember Brooks’ $68,602. Taylor ended up spending $19.66 per first choice vote while Brooks spent $22.91. Taylor had no PAC money spent in support or opposition of him. Meanwhile in the mayoral race, Cat Brooks’ opponents spent $165,509 to contest her campaign with the PAC Oaklanders for Responsible Leadership, which is made up of labor and trade unions and some supporters of Schaaf, funding the majority. PAC spending was so high this campaign season that all three district races’ spending limits were lifted by the Oakland Public Ethics Commission in order to even the playing field for the other candidates. You can read more about the effect of PACs on spending limits here in this previous coverage by Oakland North.